Definition at line 75 of file Interpreter.h. Definition at line 54 of file Interpreter.cpp. References llvm::ExecutionEngine::emitGlobals(), llvm::ExecutionEngine::getDataLayout(), and llvm::GenericValue::Untyped. Definition at line 66 of file Interpreter.cpp. Definition at line 178 of file Interpreter.h. Definition at line 257 of file ExternalFunctions.cpp. References llvm::errs(), llvm::ExecutionEngine::getDataLayout(), llvm::Function::getFunctionType(), llvm::Value::getName(), llvm::ExecutionEngine::getPointerToGlobalIfAvailable(), llvm::GlobalValue::getType(), lookupFunction(), llvm::report_fatal_error(), llvm::sys::DynamicLibrary::SearchForAddressOfSymbol(), and llvm::unique_lock< MutexT >::unlock(). Definition at line 2069 of file Execution.cpp. References llvm::Function::arg_begin(), llvm::Function::arg_end(), llvm::Function::arg_size(), assert(), llvm::ArrayRef< T >::begin(), llvm::BasicBlock::begin(), callExternalFunction(), llvm::ExecutionContext::CurBB, llvm::ExecutionContext::CurFunction, llvm::ExecutionContext::CurInst, E, llvm::ArrayRef< T >::end(), F(), llvm::Function::front(), llvm::Function::getFunctionType(), llvm::Function::getReturnType(), llvm::GlobalValue::isDeclaration(), llvm::FunctionType::isVarArg(), SetValue(), llvm::ArrayRef< T >::size(), and llvm::ExecutionContext::VarArgs. Referenced by runAtExitHandlers(), runFunction(), and visitCallSite(). Create a new interpreter object. Definition at line 34 of file Interpreter.cpp. Definition at line 819 of file Execution.cpp. References llvm::ExecutionContext::Caller, llvm::CallSiteBase< FunTy, BBTy, ValTy, UserTy, UseTy, InstrTy, CallTy, InvokeTy, CallBrTy, IterTy >::getInstruction(), llvm::CallSiteBase< FunTy, BBTy, ValTy, UserTy, UseTy, InstrTy, CallTy, InvokeTy, CallBrTy, IterTy >::getType(), llvm::APInt::getZExtValue(), I, llvm::GenericValue::IntVal, llvm::Type::isVoidTy(), runAtExitHandlers(), SetValue(), llvm::GenericValue::Untyped, and llvm::APInt::zextOrTrunc(). Definition at line 182 of file Interpreter.h. Definition at line 110 of file Interpreter.h. Definition at line 96 of file Interpreter.h. Definition at line 2106 of file Execution.cpp. References llvm::ExecutionContext::CurInst, llvm::dbgs(), LLVM_DEBUG, and llvm::InstVisitor< Interpreter >::visit(). Referenced by runAtExitHandlers(), and runFunction(). runAtExitHandlers - Run any functions registered by the program's calls to atexit(3), which we intercept and store in AtExitHandlers. Definition at line 70 of file Interpreter.cpp. References callFunction(), llvm::None, and run(). run - Start execution with the specified function and arguments. 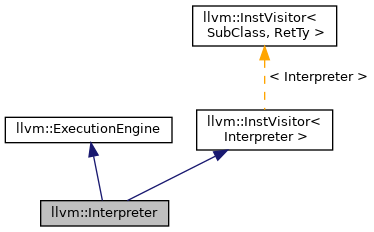 Definition at line 80 of file Interpreter.cpp. References assert(), callFunction(), llvm::Function::getFunctionType(), llvm::FunctionType::getNumParams(), run(), llvm::ArrayRef< T >::size(), and llvm::ArrayRef< T >::slice(). Definition at line 961 of file Execution.cpp. References assert(), llvm::dbgs(), E, getBitWidth(), llvm::ExecutionEngine::getDataLayout(), llvm::StructLayout::getElementOffset(), llvm::PointerType::getElementType(), llvm::generic_gep_type_iterator< ItTy >::getIndexedType(), llvm::Instruction::getOpcode(), llvm::generic_gep_type_iterator< ItTy >::getOperand(), llvm::User::getOperand(), llvm::DataLayout::getStructLayout(), llvm::generic_gep_type_iterator< ItTy >::getStructTypeOrNull(), llvm::AllocaInst::getType(), llvm::Value::getType(), llvm::DataLayout::getTypeAllocSize(), llvm::ConstantInt::getZExtValue(), llvm::APInt::getZExtValue(), I, llvm::GenericValue::IntVal, llvm::tgtok::IntVal, llvm::Type::isPointerTy(), LLVM_DEBUG, llvm::max(), llvm::GenericValue::PointerVal, llvm::PTOGV(), llvm::safe_malloc(), and SetValue(). Definition at line 1189 of file Execution.cpp. References llvm::GenericValue::AggregateVal, llvm::APInt::ashr(), assert(), llvm::APInt::bitsToDouble(), llvm::APInt::bitsToFloat(), llvm::APInt::doubleToBits(), llvm::GenericValue::DoubleVal, llvm::APInt::floatToBits(), llvm::Type::FloatTyID, llvm::GenericValue::FloatVal, llvm::IntegerType::getBitWidth(), getBitWidth(), llvm::APInt::getBitWidth(), llvm::ExecutionEngine::getDataLayout(), llvm::User::getOperand(), llvm::DataLayout::getPointerSizeInBits(), llvm::Type::getPrimitiveSizeInBits(), llvm::Type::getScalarSizeInBits(), llvm::Type::getScalarType(), getShiftAmount(), llvm::Value::getType(), llvm::Type::getTypeID(), llvm::APInt::getZExtValue(), llvm::GenericValue::IntVal, llvm::Type::isDoubleTy(), llvm::Type::isFloatingPointTy(), llvm::Type::isFloatTy(), llvm::Type::isIntegerTy(), llvm::DataLayout::isLittleEndian(), llvm::Type::isPointerTy(), llvm::Type::isVectorTy(), llvm_unreachable, llvm::APInt::lshrInPlace(), llvm::GenericValue::PointerVal, llvm::APIntOps::RoundAPIntToDouble(), llvm::APIntOps::RoundAPIntToFloat(), llvm::APIntOps::RoundDoubleToAPInt(), llvm::APIntOps::RoundFloatToAPInt(), llvm::APIntOps::RoundSignedAPIntToDouble(), llvm::APIntOps::RoundSignedAPIntToFloat(), SetValue(), llvm::APInt::sext(), llvm::size(), llvm::APInt::trunc(), llvm::Type::VectorTyID, llvm::APInt::zext(), and llvm::APInt::zextOrTrunc(). Definition at line 680 of file Execution.cpp. References llvm::MCID::Add, llvm::GenericValue::AggregateVal, assert(), llvm::dbgs(), executeFAddInst(), executeFDivInst(), executeFMulInst(), executeFRemInst(), executeFSubInst(), FLOAT_VECTOR_OP, llvm::BinaryOperator::getOpcode(), llvm::User::getOperand(), llvm::Value::getType(), I, INTEGER_VECTOR_FUNCTION, INTEGER_VECTOR_OPERATION, llvm::GenericValue::IntVal, llvm::Type::isVectorTy(), llvm_unreachable, llvm::APInt::sdiv(), SetValue(), llvm::APInt::srem(), llvm::APInt::udiv(), and llvm::APInt::urem(). Definition at line 1708 of file Execution.cpp. References llvm::User::getOperand(), llvm::Value::getType(), and SetValue(). Definition at line 880 of file Execution.cpp. References llvm::BranchInst::getCondition(), llvm::BranchInst::getSuccessor(), llvm::tgtok::IntVal, and llvm::BranchInst::isUnconditional(). Definition at line 153 of file Interpreter.h. Definition at line 1062 of file Execution.cpp. References llvm::CallSiteBase< FunTy, BBTy, ValTy, UserTy, UseTy, InstrTy, CallTy, InvokeTy, CallBrTy, IterTy >::arg_begin(), llvm::CallSiteBase< FunTy, BBTy, ValTy, UserTy, UseTy, InstrTy, CallTy, InvokeTy, CallBrTy, IterTy >::arg_end(), llvm::CallSiteBase< FunTy, BBTy, ValTy, UserTy, UseTy, InstrTy, CallTy, InvokeTy, CallBrTy, IterTy >::arg_size(), llvm::ExecutionContext::Caller, callFunction(), llvm::ExecutionContext::CurInst, F(), llvm::GenericValue::IntPair::first, llvm::CallSiteBase< FunTy, BBTy, ValTy, UserTy, UseTy, InstrTy, CallTy, InvokeTy, CallBrTy, IterTy >::getCalledFunction(), llvm::CallSiteBase< FunTy, BBTy, ValTy, UserTy, UseTy, InstrTy, CallTy, InvokeTy, CallBrTy, IterTy >::getCalledValue(), llvm::CallSiteBase< FunTy, BBTy, ValTy, UserTy, UseTy, InstrTy, CallTy, InvokeTy, CallBrTy, IterTy >::getInstruction(), llvm::Function::getIntrinsicID(), llvm::Instruction::getParent(), llvm::GVTOP(), llvm::GlobalValue::isDeclaration(), llvm::IntrinsicLowering::LowerIntrinsicCall(), llvm::Intrinsic::not_intrinsic, llvm::GenericValue::IntPair::second, SetValue(), and llvm::GenericValue::UIntPairVal. Definition at line 1745 of file Execution.cpp. References llvm::GenericValue::AggregateVal, llvm::dbgs(), llvm::Type::DoubleTyID, llvm::Type::FloatTyID, llvm::User::getOperand(), llvm::Value::getType(), llvm::Type::getTypeID(), llvm::Type::IntegerTyID, llvm_unreachable, and SetValue(). Definition at line 1878 of file Execution.cpp. References llvm::GenericValue::AggregateVal, llvm::Type::ArrayTyID, llvm::Type::DoubleTyID, llvm::GenericValue::DoubleVal, llvm::Type::FloatTyID, llvm::GenericValue::FloatVal, llvm::ExtractValueInst::getAggregateOperand(), llvm::ExtractValueInst::getIndexedType(), llvm::ExtractValueInst::getIndices(), llvm::ExtractValueInst::getNumIndices(), llvm::Value::getType(), llvm::Type::getTypeID(), llvm::ExtractValueInst::idx_begin(), llvm::Type::IntegerTyID, llvm::GenericValue::IntVal, llvm_unreachable, llvm::Type::PointerTyID, llvm::GenericValue::PointerVal, SetValue(), llvm::Type::StructTyID, and llvm::Type::VectorTyID. Definition at line 609 of file Execution.cpp. References llvm::dbgs(), executeFCMP_BOOL(), executeFCMP_OEQ(), executeFCMP_OGE(), executeFCMP_OGT(), executeFCMP_OLE(), executeFCMP_OLT(), executeFCMP_ONE(), executeFCMP_ORD(), executeFCMP_UEQ(), executeFCMP_UGE(), executeFCMP_UGT(), executeFCMP_ULE(), executeFCMP_ULT(), executeFCMP_UNE(), executeFCMP_UNO(), llvm::CmpInst::FCMP_FALSE, llvm::CmpInst::FCMP_OEQ, llvm::CmpInst::FCMP_OGE, llvm::CmpInst::FCMP_OGT, llvm::CmpInst::FCMP_OLE, llvm::CmpInst::FCMP_OLT, llvm::CmpInst::FCMP_ONE, llvm::CmpInst::FCMP_ORD, llvm::CmpInst::FCMP_TRUE, llvm::CmpInst::FCMP_UEQ, llvm::CmpInst::FCMP_UGE, llvm::CmpInst::FCMP_UGT, llvm::CmpInst::FCMP_ULE, llvm::CmpInst::FCMP_ULT, llvm::CmpInst::FCMP_UNE, llvm::CmpInst::FCMP_UNO, llvm::User::getOperand(), llvm::CmpInst::getPredicate(), llvm::Value::getType(), I, llvm_unreachable, and SetValue(). Definition at line 1673 of file Execution.cpp. Definition at line 1693 of file Execution.cpp. Definition at line 1688 of file Execution.cpp. Definition at line 1668 of file Execution.cpp. Definition at line 1031 of file Execution.cpp. References llvm::gep_type_begin(), llvm::gep_type_end(), llvm::GetElementPtrInst::getPointerOperand(), and SetValue(). Definition at line 277 of file Execution.cpp. References llvm::dbgs(), executeICMP_EQ(), executeICMP_NE(), executeICMP_SGE(), executeICMP_SGT(), executeICMP_SLE(), executeICMP_SLT(), executeICMP_UGE(), executeICMP_UGT(), executeICMP_ULE(), executeICMP_ULT(), llvm::User::getOperand(), llvm::CmpInst::getPredicate(), llvm::Value::getType(), I, llvm::CmpInst::ICMP_EQ, llvm::CmpInst::ICMP_NE, llvm::CmpInst::ICMP_SGE, llvm::CmpInst::ICMP_SGT, llvm::CmpInst::ICMP_SLE, llvm::CmpInst::ICMP_SLT, llvm::CmpInst::ICMP_UGE, llvm::CmpInst::ICMP_UGT, llvm::CmpInst::ICMP_ULE, llvm::CmpInst::ICMP_ULT, llvm_unreachable, and SetValue(). Definition at line 912 of file Execution.cpp. References assert(), llvm::BasicBlock::begin(), llvm::ExecutionContext::CurBB, llvm::ExecutionContext::CurInst, llvm::dyn_cast(), llvm::IndirectBrInst::getAddress(), llvm::PHINode::getBasicBlockIndex(), llvm::PHINode::getIncomingValue(), llvm::GVTOP(), and SetValue(). Definition at line 1778 of file Execution.cpp. References llvm::Type::DoubleTyID, llvm::Type::FloatTyID, llvm::SequentialType::getElementType(), llvm::User::getOperand(), llvm::InsertElementInst::getType(), llvm::Type::getTypeID(), llvm::Type::IntegerTyID, llvm_unreachable, and SetValue(). Definition at line 1920 of file Execution.cpp. References llvm::MCID::Add, llvm::GenericValue::AggregateVal, llvm::Type::ArrayTyID, llvm::APInt::ashr(), llvm::dbgs(), llvm::Type::DoubleTyID, llvm::GenericValue::DoubleVal, executeCmpInst(), executeFAddInst(), executeFDivInst(), executeFMulInst(), executeFRemInst(), executeFSubInst(), executeSelectInst(), llvm::Type::FloatTyID, llvm::GenericValue::FloatVal, llvm::gep_type_begin(), llvm::gep_type_end(), llvm::InsertValueInst::getAggregateOperand(), llvm::ExecutionEngine::getConstantValue(), llvm::ExtractValueInst::getIndexedType(), llvm::InsertValueInst::getIndices(), llvm::InsertValueInst::getNumIndices(), llvm::ConstantExpr::getOpcode(), llvm::User::getOperand(), llvm::ExecutionEngine::getPointerToGlobal(), llvm::ConstantExpr::getPredicate(), llvm::Value::getType(), llvm::Type::getTypeID(), llvm::InsertValueInst::idx_begin(), llvm::Type::IntegerTyID, llvm::GenericValue::IntVal, llvm_unreachable, llvm::APInt::lshr(), llvm::Type::PointerTyID, llvm::GenericValue::PointerVal, llvm::PTOGV(), llvm::APInt::sdiv(), llvm::MCID::Select, SetValue(), llvm::APInt::shl(), llvm::APInt::srem(), llvm::Type::StructTyID, llvm::APInt::udiv(), llvm::APInt::urem(), llvm::ExecutionContext::Values, and llvm::Type::VectorTyID. Definition at line 169 of file Interpreter.h. Definition at line 1703 of file Execution.cpp. Definition at line 154 of file Interpreter.h. Definition at line 1037 of file Execution.cpp. References llvm::dbgs(), llvm::LoadInst::getPointerOperand(), llvm::Value::getType(), llvm::GVTOP(), I, llvm::LoadInst::isVolatile(), llvm::ExecutionEngine::LoadValueFromMemory(), PrintVolatile, and SetValue(). Definition at line 1162 of file Execution.cpp. References llvm::GenericValue::AggregateVal, assert(), llvm::User::getOperand(), getShiftAmount(), llvm::Value::getType(), llvm::APInt::getZExtValue(), llvm::GenericValue::IntVal, llvm::Type::isVectorTy(), llvm::APInt::lshr(), and SetValue(). Definition at line 134 of file Interpreter.h. Definition at line 1698 of file Execution.cpp. Definition at line 862 of file Execution.cpp. References llvm::Value::getContext(), llvm::User::getNumOperands(), llvm::ReturnInst::getReturnValue(), llvm::Value::getType(), and llvm::Type::getVoidTy(). Definition at line 805 of file Execution.cpp. References executeSelectInst(), llvm::User::getOperand(), llvm::Value::getType(), and SetValue(). Definition at line 1658 of file Execution.cpp. Definition at line 1135 of file Execution.cpp. References llvm::GenericValue::AggregateVal, assert(), llvm::User::getOperand(), getShiftAmount(), llvm::Value::getType(), llvm::APInt::getZExtValue(), llvm::GenericValue::IntVal, llvm::Type::isVectorTy(), SetValue(), and llvm::APInt::shl(). Definition at line 1810 of file Execution.cpp. References llvm::Type::DoubleTyID, llvm::Type::FloatTyID, llvm::SequentialType::getElementType(), llvm::User::getOperand(), llvm::ShuffleVectorInst::getType(), llvm::Type::getTypeID(), llvm::Type::IntegerTyID, llvm_unreachable, and SetValue(). Definition at line 1683 of file Execution.cpp. Definition at line 1048 of file Execution.cpp. References llvm::dbgs(), llvm::User::getOperand(), llvm::StoreInst::getPointerOperand(), llvm::Value::getType(), llvm::GVTOP(), I, llvm::StoreInst::isVolatile(), PrintVolatile, and llvm::ExecutionEngine::StoreValueToMemory(). Definition at line 893 of file Execution.cpp. References llvm::SwitchInst::cases(), executeICMP_EQ(), llvm::SwitchInst::getCondition(), llvm::SwitchInst::getDefaultDest(), llvm::Value::getType(), and llvm::GenericValue::IntVal. Definition at line 1653 of file Execution.cpp. Definition at line 1678 of file Execution.cpp. Definition at line 876 of file Execution.cpp. Definition at line 1716 of file Execution.cpp. References llvm::dbgs(), llvm::GenericValue::IntPair::first, llvm::User::getOperand(), llvm::Value::getType(), llvm::Type::getTypeID(), IMPLEMENT_VAARG, llvm::Type::IntegerTyID, llvm::GenericValue::IntVal, llvm_unreachable, llvm::GenericValue::IntPair::second, SetValue(), and llvm::GenericValue::UIntPairVal. Definition at line 1663 of file Execution.cpp.